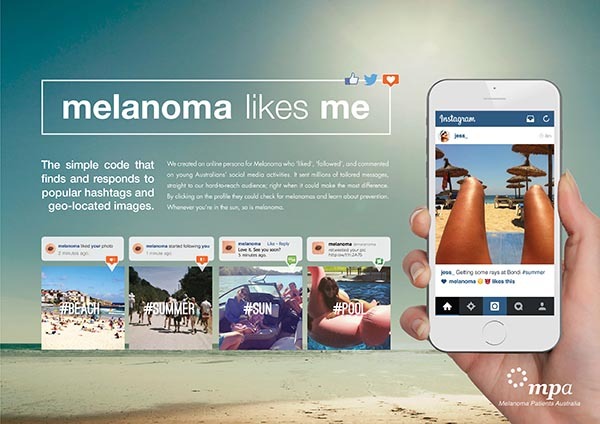 Melanoma Likes Me, a digital advertising campaign from Melanoma Patients Australia, has won the Grand Prix for Good at Spikes Asia, alongside Gold for Direct, Media, and Promo & Activation. 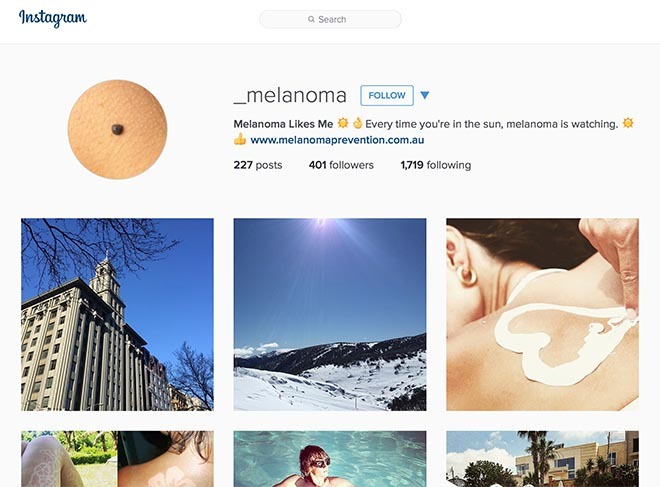 An online persona was created for Melanoma, making it possible for the skin cancer Instagram account and Twitter account to like, follow and comment on the social media activity of young Australians spending time in the sun. A unique algorithm found and responded to popular hashtags and geo-located images. It sent millions of tailored messages, straight to our hard-to-reach audience; right when it could make the most difference. By clicking on the profile they could check for melanomas and learn about prevention. Whilst many people think melanoma only happens to older people, in actual fact, more and more young Australians are being diagnosed with melanoma. It is the most lethal cancer for those aged between 15 and 30. The objective of the Melanoma Likes Me campaign was to reach people at the key moment they were exhibiting unsafe sun behavior. It was less about driving huge traffic to the website, but more about making them put on sunscreen and a t-shirt. Over 2 million people received Melanoma’s messages over the summer of 2014/2015. Unique Visit to the Skincheck mobile site during the Summer campaign increased by 1371%. George Patterson Y&R used the Instagram API “location” and “tag” endpoints, and the Twitter API “search” endpoint, to retrieve recent post data based on relevant geolocations and hashtags. Both APIs returned JSON-encoded post data, which was deserialised and cached on the Melanoma Prevention server. Retrieved post data was compared to existing cached data to find new posts, and the social media team was notified of updates in real-time. The campaign rolled out predominantly across Instagram and Twitter, whilst Melanoma also had a presence on Facebook. The Melanoma Likes Me campaign was developed at George Patterson Y&R, Brisbane and Melbourne by chief creative officer Ben Coulson, creative director Andrew Thompson, copywriter Ellen Fromm, art director Isabella Caruso, digital producer Grace Francis, digital developer Jake Pospischil, designer Lloyd Budd, chief digital officer Rob Hudson, graphic designer Ross Benn, and group account director Fiona Caird.